Have you ever attempted to setup an automated backup of your SQL Server Express database server, only to discover that the handy job scheduler maintenance options that you are accustomed to using with the full version of SQL Server are not available with the express edition? After a brief search of Google, you may have noticed that others have managed to implement this procedure, but they either ended up purchasing a 3rd party product solution or they are using the less than ideal practice of pausing the SQL Server Express Service in order to create a backup copy of the MDF and LDF files (this means that the SQL Server is briefly taken offline). This works, but for servers that must be live on a 24/7 basis, this is not the best solution. Backups require installing the SQL Server Management Studio Express. This is a free download that comes with recent versions of SQL Server Express. Select it from the same place you download the main program. If you are using SQL Server Express 2008 R2 SP1 or earlier, there is a separate download link. For more information on the different versions and links for downloads, visit our SQL Server Express: Version Comparison Matrix and Free Downloads page. The examples below show screenshots from SQL Server Management Studio Express 2014, which is similar to earlier versions of SQL Server Express. Run SQL Server Management Studio Express. In the tree view, expand Server Objects => New Backup Device. For Device Name, type in a name for your new backup job. For Destination, select the path to store the backups. In most cases, it is best to use an location on another device. Right click on the new backup device that you just created and select the option called "Backup Database". Select the backup type (most often this is "Full"). Name: Create a name for the backup job. To verify the backup output yourself, check the destination folder to ensure that the backup file exists. The backup of the database is in the form of a .bak file. The setup of the backup job is now complete. Repeat these steps for each database you wish to backup. 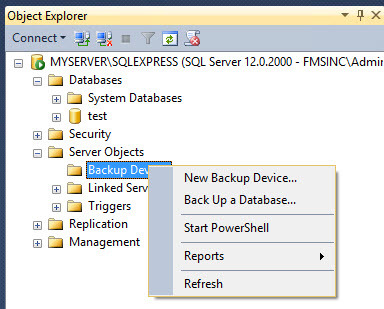 "BACKUP DATABASE MASTER TO TESTBACKUP"
..where "MYSERVER" is the name of the SQL Server physical machine. ..where "OFFICESERVERS" is the name of the SQL Server. ..where "TESTBACKUP" is the name of the backup job. ..where "MASTER" is the name of the database. The built in Microsoft Windows Scheduler and assign the batch file created above to a scheduled event. FMS offers a program Total Visual Agent, which includes the ability to execute and run a specified batch command on the schedule that best suits your needs and maintain an audit log.